The Creative Bar, a leading Southern California design, marketing and branding firm, was honored to be selected as a winner in the 2013 American Package Design Awards for their work with client, Regalo Perfetto. This marks the very first award in 2013, after winning a total of thirteen (13) national design & advertising awards in 2012. For five decades, Graphic Design USA has sponsored national design competitions spotlighting areas of excellence and opportunity for creative professionals. 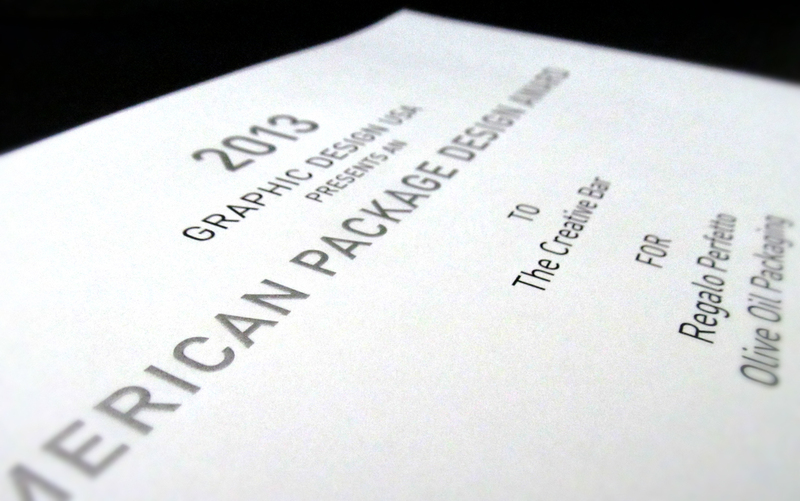 Of these, the American Package Design Awards continue to be the fastest growing. This competition celebrates well-designed graphics but also the power of design to advance the brand promise and forge an emotional connection with the buyer at the moment of truth. The Regalo Perfetto Olive Oil packaging will be published in the March/April 2013 Graphic Design USA printed magazine, online on its website and in the new GDUSA app.